Credicorp bought MiBanco for $179m. According to the stated equity on the MixMarket, this would suggest they paid 1.25x the net equity of the bank, for a 61% stake. This is a low price compared to most microfinance transactions, but let’s face it, it wasn’t Peru’s best bank. The owner already has the second biggest microfinance bank in Peru (by number of clients), Edyficar, thus the combined bank is a monster – a fifth of the entire sector. If this was too big to fail before, it’s just got bigger. And of course, while the initial fears over the fate of MiBanco have momentarily subsided, the underlying problems remain identical to last week. Over-indebtedness is still a problem, MiBanco has a poor quality portfolio and is bleeding clients. Shifting shareholders doesn’t change that. Indeed, some might argue that paying any premium over book value for this bank was generous. Obviously Grupo ACP are out of the hole for a while, flush with cash, and there is no danger of defaulting on the bond now. They’ve sold off the family silver, however. An undignified outcome for both ACP and MiBanco without the underlying problem solved – little to celebrate. And technically speaking the deal has not yet been approved. Indeed, one might suspect that political manoeuvrings behind the scenes got the deal on the table in the first place, so it is unlikely it will fall at the final hurdle. Needless to say ACP had another spin on this. This was not a firesale apparently, but part of a cunning plan: “We do also believe that the main goal that motivated us for 45 years has been accomplished.” It is probably true that they set out to financialize the poor of Peru, and have played a stellar role in that process for better or for worse. They have left a mature microfinance sector in their wake. Perhaps too mature? But the reality is that this was a firesale prompted by a looming default on a bond due to declining earnings in their rather undiversified portfolio in a country that looks worryingly over-indebted. I doubt this was the plan hatched nearly half a century ago. There were a couple of marginally profitable Peruvian assets, and they had already flogged the Bolivian bank (once again, all part of the plan apparently). To raise the sums ACP required, trying to sell a loss-making Mexican asset in a hurry was hardly ideal. They had no option, but don’t kid yourself – there was nothing either clever or strategic about this deal, their back was against the wall because they had over-leveraged themselves. Ring any bells? Obtaining an equity injection from the other investors, such as Triodos was not possible as these minority shareholders were none too impressed with ACP. ACP had previously tried to raise equity capital in Luxembourg, but had been unable to due to its legal structure as an NGO. The relationship between ACP, MiBanco and Credicorp has a history. In 2011 Credicorp had tried to buy MiBanco from ACP. When Edyficar was up for sale, ACP tried to buy it. So, finally the family is reunited. The article estimates the value of MiBanco as of the end of 2013 at US$311. The actual deal was $179m to buy 61% of the bank, suggesting the total value (i.e. 100%) of the bank to be about $295m, so a little lower than their valuation. But in fact this valuation is 37% below what the bank was worth in 2007, according to the article. So, since 2007 the management team actually did quite a spectacular job of destroying value for MiBanco’s shareholders. ACP clearly suffered as a result of this, but microfinance investor Triodos are unlikely to be too pleased about this erosion of value at one of their principal investments. Remember also that in 2013 the equity on the balance sheet of MiBanco fell by 7% alone. Triodos will have to explain this rather awkward result to its own Dutch investors, and while this was not Triodos’s fault necessarily, that doesn’t make the case any easier to justify. What is interesting here is that in fact Credicorp paid relatively little for MiBanco. The once heralded star of Latin American microfinance was sold for a song. (For readers that are not familiar with equity valuation, skip this section). Basically the bank was sold at 1.25x book value, based on the relatively limited data available on Mix. This is at the very lowest end of the 1.3x to 1.9x range suggested by CGAP as the usual pricing. Presumably this incorporates Credicorp’s discount applied to compensate for restructuring costs, write-offs, integration expenses and redundancy payments. To put this in context, Credicorp paid a 25% premium over the book value of MiBanco in 2014. When Credicorp bought Edyficar in 2009 they paid a premium of 150% over book value. This was a firesale. So, what is Credicorp going to do? First of all, it will probably find that half the clients of MiBanco are their clients already, which will be a little worrying. Paying off your loan at Bank A with a loan from Bank B is one thing, but they are now the same bank. They will presumably cut a significant portion of the headcount, at all levels of the bank. It will be astonishing if any of the senior management team at MiBanco are allowed to stay on, but friendships run deep in these banks, and likely the main lay-offs will be the junior staff, but we shall see. You don’t need two CEOs, and right now it is pretty clear which one is doing a better job. Redundancy costs will be high in Peru. Another pertinent question is whether the newly formed entity will operate under the Edyficar brand, or MiBanco’s, or remain separate. Edyficar is a solid, well-run bank and seems the obvious choice, but common sense should not be taken for granted in this sector – MiBanco is bigger and has a stronger brand name, so maybe that is perceived as better? Edyficar is in far better shape than MiBanco. According to the MixMarket its return on assets is 4.23%, return on equity is 40.95%. MiBanco wrote off approximately 5% of its portfolio in each of the last two years, while Edyficar wrote off a mere 2.22% in 2012 (2013 data not available). Only 4.38% of Edyficar’s clients are overdue on loan repayments by more than 30 days, and 3.16% at 90 days – a little over half the levels reported by MiBanco. The deal may provide some respite to ACP, but there are two major problems that have not vanished. 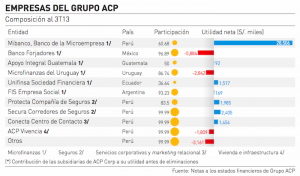 They are exactly the same as before this crisis struck Grupo ACP. Over-indebtedness is high, and MiBanco’s non-performing loans are high. Its clients are not repaying their loans. Just because the shareholder abruptly changed will not change that. Compared to MiBanco, Edyficar is well-run, its portfolio is notably better quality, with fewer write-offs. Merging the portfolio of MiBanco is going to deteriorate the overall picture. And it seems unusual to suppose that Credicorp bought MiBanco in order to slow down lending, in all likelihood it will clean up the mess and ramp up the growth once again. Whatever the strategy is, do we expect the merged company will somehow try to manage, or even reduce, over-indebtedness? 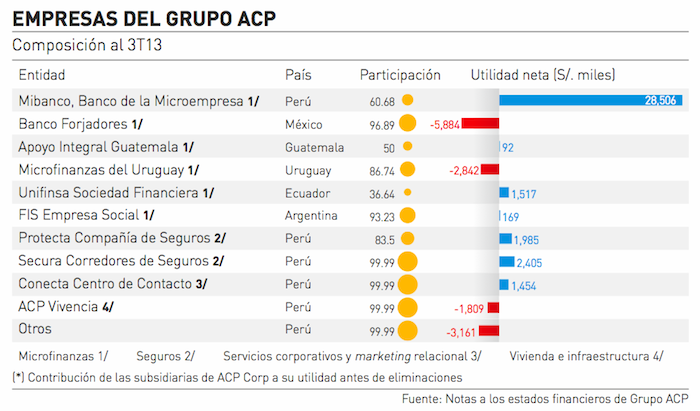 And now Peru is debatably even less prepared for a systemic crisis in the microfinance sector. A collapse of MiBanco could have triggered a broader collapse across the sector, and now the MiBanco/Edyficar union is even bigger. Too big to fail? Frankly, anyone thinking this problem is over is deluded. This might be just the beginning. So, is there a crisis looming? I don’t know. Many ingredients for a storm are present while others are notably absent, as I blogged previously. All it would take is a spark, as in previous crises, often from unexpected sources. There are certainly warning signs, but hopefully this “incident” will send a valuable warning signal to the sector, and in particular to the regulator, that they need to do something. What could this be? I reckon there are a few key steps here that would reduce the chance of the situation deteriorating. The regulator needs to take pro-active steps to reassure the Peruvian microfinance sector and the international investing community that it is in control, aware of the problems, willing to take action if the situation deteriorates, and is credibly run. It has mud on its face that it permitted this recent debacle to occur in the first place, but no point crying over spilt milk, it needs to look forwards and with confidence. A possible step, taking a leaf out of Bolivia, Ecuador and Colombia’s books, would be to declare an interest rate cap. This essentially stops poor people being exploited. Interest rates are not that high in Peru in general but there are outliers, charging up to 200% in cases. Get these out. Placing a cap at 50% will have minimal impact on the vast majority of the sector. The banks that really cannot survive without charging rates of 200% – does Peru need them anyway? This would take a little steam out of the sector (not a lot: such loans are thankfully rare), but it would reinforce the signal to the market: “we are not messing about, 50% isn’t so bad, those Ecuadorians are on 30%, step in line as we could always reduce this again”. It’s a warning shot. The free-market fanatics will complain that it is anti-free-market, and also anti their bonuses. Ignore them, a 50% cap is fine. Insert a minor tax on capital departing the country, perhaps 1% (Ecuador is at 5%). This prevents short-term speculative funds bidding up the sector too rapidly. Again, the idea is to take a little steam out, but on the investing side, and also to send a warning shot. This will not create a panic, but it will have an impact at the margin, and a psychological effect. Plus this would generate tax revenue for the Peruvian government to ideally do something useful with. An alternative to this is to place some sort of minimum capital requirement at the banks. The regulator didn’t intervene soon enough in the case of MiBanco, and now it has an even bigger beast to manage, and more people watching it, so it should keep an extremely close eye on this merger, and not hesitate to intervene at the first sign of trouble. Something going wrong at a bank that controls 20% of the sector is never pretty. The regulator may wish to extend its oversight to the shareholders of their banks. How many others are as wobbly as MiBanco? The unusual element in this case was that it was triggered not by the bank itself, but by its main shareholder. So, keep an eye on the shareholders. I have no idea if the regulator was doing this previously – if so it wasn’t doing it very well. If not, now might be a good opportunity to start. Tighten client protection rules. I am not sure what sort of ombudsman there is in the country, but the last thing the regulator wants is civil unrest against the banks. If there is animosity against banks amongst over-indebted borrowers there ought be a formal channel they can vent their frustration through, and that will offer some form of bankruptcy protection to the poor and rigorous deposit insurance. This might sound overly interventionist, but bear in mind most “developed” countries have precisely this sort of provision, and one need look no further than Nicaragua to see what happens when the borrowers take matters into their own hands. Plus, again, this is wise signalling. Not just to the banks and their investors, but also to the borrowers. Tighten the rules for measuring clients’ borrowing ability. Indeed, the regulator could limit the number of loans a client may have simultaneously. When a client is managing more than five loans simultaneously one has to wonder if this is healthy. Plus it would force clients to think carefully about who they borrow from, essentially using up one of their five “permits” each time, rather than walking onto any street corner in Peru and getting a loan over the counter. There will be a continued “period of consolidation” in the sector. This is investor-talk for a period of collapses, with a nice spin applied. This is not necessarily a bad thing, but it has to be managed in a controlled way. A string of collapses is never nice, better to anticipate this and wind them down slowly. A bit like demolishing a building. The banks need to calm down the relentless competitiveness and desire to perpetually steal one another’s clients, constantly rise in the ranking tables and retain market share. In the short-run such behaviour may produce results, in the long run it is cannibalism and leads to over-indebtedness and possible crisis. Is it too much to ask that they collaborate somehow? Fierce competition is so engrained in the Peruvian microfinance sector (for better and for worse) that this will be a hard cultural shift to initiate. External prompting from the regulator will be required, but soft intervention can also work. Ideally this would also come from the investors, who may have the prudence to suggest that a healthy 10% growth rate is preferable to a 30% dash towards an imaginary finish line. But here I am entering into the role of pure fantasy, the odds of investors with the whiff of profit in their nostrils turning down a quick buck is not the most likely outcome highlighted here. The fact that the Economist Intelligence Unit declared, for the sixth year in a row, that Peru is the best regulated microfinance country on Earth suggests at least one word in their name might not be entirely valid. Any false confidence this imparts upon the regulator should be re-assessed in light of this recent mess. But there is no crisis yet. There is time to fix this. It is not too late. But the warning signs are clearly visible, the fact that the entire sector hasn’t collapsed does not imply the warning signs should be ignored. Alas the global microfinance sector has established an incredible tendency to ignore such warnings and wonder aimlessly off cliffs. But this is neither inevitable nor unavoidable. There are no doubt 100 other measures that the regulator is looking into currently that I am unaware of, and I sincerely hope they can act wisely in the best interests not only of investors but also of the Peruvian public. The trick is confidence. The SBS should activate all the tools at its disposal to fine-tune the sector – no brash moves that could trigger a crisis/exodus/bankruptcy etc. Subtle moves that restore confidence and protect not only the banks, and their investors, but also the poor. Too much to hope for? Yes, probably. Correction to previous post: Accion had already been flogged to Bamboo some years ago. Thanks to an anonymous reader for the correction. This entry was posted in Uncategorized and tagged Edyficar, Grupo ACP, MiBanco, Triodos. Bookmark the permalink.